The Dream Pad with High Frequency branding is a stripped-down version of the Dream Pad by Mad Catz, for sale in North American branches of Toys 'R' Us. It is largely the same controller but lacks the programming features and rubber grips. 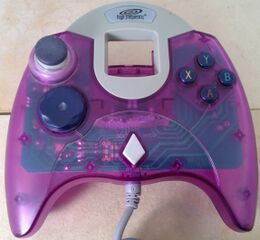 Like the standard Dream Pad, this High Frequency model suffers from the same issues with sticky triggers and detachable thumbstick covers, so is unlikely to last as long as a standard Dreamcast controller. These models are not thought to have been released outside of North America and only came in "transparent" varieties.